Not in the same way-they are HERE. They are participating in life and making new memories, new connections and strengthening old ones. I’m afraid their grief will be overlooked, unacknowledged-swept under the giant rug of life and busyness that seems to cover everything unpleasant or undervalued. If the course of a bereaved parent’s grief is marked by initial outpouring of concern, comfort and care followed by the falling away of friends, family and faithful companionship then that of a bereaved sibling is doubly so. Surviving children often try to lessen a grieving parent’s burden by acting as if “everything is OK”. But it’s not-it is definitely NOT. Their world has been irrevocably altered. They have come face-to-face with mortality, with deep pain, with an understanding that bad things happen-happen to people they love-without warning and without remedy. They are forced to rethink their family, their faith and their future without a life-long friend and companion. Part of their history is gone. If surviving children are young, it can be so, so easy to mistake the natural enthusiasm and excitement of youth for complete healing. They are often busy with events, education, work and life and the grief they still feel may go unnoticed-even by themselves. But they need safe, consistent and compassionate care while they navigate grief and the enduring impacts of sibling loss. School counselors, grief counselors or mature and emotionally stable adult friends can be very helpful during this process. If you observe any of these changes, get help. A grieving parent is rarely able to be the sole source of intensive counsel for a bereaved child-someone outside the grief circle may be a better choice. Adult children-even those married and with kids of their own-are also changed forever by saying “good-bye” to a brother or sister. Addiction, depression and physical health issues can surface in the wake of loss. It’s not always easy to connect the dots back to grief since life is full of stress and strain and they may need help. My children have been blessed to have friends and loved ones who give them a safe place to go when grief overwhelms them or when other stressors on top of grief make life really hard. Don’t assume that because time has gone by, they are all better. They may not want to talk about it and that’s OK. But if they do, listen. Without platitudes, without judgement-just be a safe place. And if you notice something that’s just not “quite right” try to get them the help they may need to make it through this hard place. Bereaved families are often doing the best they can, but they can’t do it alone. When you bless my earthly children, you bless me. When you give them space to grieve, you give me space to breathe. When you encourage them, you encourage my heart too. It’s a couple of months over two years since Luke chose to go back home. His brother and sister as you say Melanie have been very much over looked. Our daughter was on the train home for the weekend to celebrate her degree result when the police came to tell us. Her life fell apart. It’s been a hard road for her since. She isolated herself and her anxiety became unmanageable, her hard worked for degree became pointless to her. Evenually she too went to a place were her thoughts turned suicidal. I am thankful that God has a different path for her and is healing but as you say she became unseen. So too with our son. He has two young children, he tucked away his grief. He has become very much isolated, doesn’t go out, can’t work and unable to seek help. Recently I can see the beginnings of some “letting go” but it breaks my heart to see him hurting so. Our family was small to begin with, only the five of us…four just doesn’t seem enough! Doesn’t hit the mark for us…we flounder. The siblings are floundering being only two and not three. Their grief is very different, the pace of healing is different as was their relationship with their brother. This lifelong hurting is so hard to live with, so difficult a path to find a way through. The siblings do get overlooked, I’m guessing people think oh they’re young, they’ll get over it. I don’t think they ever will. I think they will never get iver it. They are changed forever and are still learning to live with their new selves, all at a time when they were only just beginning their adult lives. I pray that God protects them and gives them comfort. I ask Him for strength of mind and wisdom to assist them as they heal and for a long life so I can be here for as long as they need me. I can very much relate to your daughter. I am not sure how old she was/is but I am 35. Blake was 23. Would have been 24 in July. We were 11 years apart and he was my buddy. He would call in the middle of the night. Just to talk. We were wired the same. On March 10th it will be 5 months from when he died. He was a Marine. And my kids (12 and 8) are grieving too. So being a sibling that is grieving and a mom that is grieving along side my two boys is hard. And people do just forget the siblings. We don’t want attention just someone to know we are still here. And still hurting. I am sorry for your loss and please let your son and daughter know they are not alone. Oh Stephanie how very hard for you and it is very early in your journey. You will find a way to travel along this road but just by watching my two surviving children I know it is a hard journey. Luke was 30 when he died to suicide and his brother 26 and sister 23. Thanks for including siblings. My brother was murdered when I was 11, he was 16. People have always asked dumb questions like, did you understand what was going on or do you remember it? I was 11! I’ve always felt my grief forgotten and diminished. Now my third child has passed away as well and people have a way of belittling that grief as well because he was three months old. I’ve been following your blog. Thanks for writing. Children’s Grief Awareness Day is on 17 November, a global day designed to help us all become more aware of the needs of grieving children — and of the benefits they obtain through the support of others. The theme for this year’s Children’s Grief Awareness Week is #MakeTime2Listen. 1 in 29 children and young people in our schools have been bereaved of a parent or sibling – that’s roughly one per class. So difficult for the sibling/s left behind. My son turned 19 just a few days before by daughter went to heaven at the age of 17 from cancer. We just passed the 5 1/2 year mark. I cannot reach my son. In the first year, he seemed to kind of ‘disappear’ in a way. He went back to school, didn’t call much and never came home. He had a bit of a bumpy road for a while with some choices he was making. Left school. Moved back home for a while until we moved back to Colorado. He eventually found his way back to us, lived with us when he first got settled, then moved out with his girlfriend. We recently moved to Florida so there is physical distance between us once again. My heart hurts for the boy left behind. The one I used to feel so very close to. He is difficult to connect with. He hates to be on the phone so phone calls are not very productive. He is so pleasant to be with in person, but you never really can get to the heart of things with him. He does not talk about his grief, his sister or being ‘left’ as an only child. It just kills me. I lost a sibling when I was 17, but I had 5 other siblings to lean on. He has none. My heart breaks for all that he has lost. I hope that someday, we find a way back to each other. I love him so dearly. He is now 24. Tonya, I am so very sorry. That is a heavy burden to bear. I pray that you have a safe friend who will love you in this painful time. I will keep you in my prayers. Tell us about them and why you loved them. Reblogged this on Welcome to crazy. Thank you for sharing this. 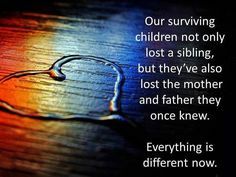 I’m truly grateful that others are spreading the word about sibling grief and the need for support over the long haul. You are so welcome-it’s hard to balance all the demands as a mother and they are multiplied as a grieving mother. May the Lord strengthen you for each day as you miss Erin and wait for reunion. Thanks for sharing this, Melanie.